Above is the picture of a highly competent leader who will not be the next CEO of Microsoft. That is really bad news for Microsoft. They are in the midst of a CEO search. Things are bad for Microsoft in a lot of very important areas due to the comical mismanagement of current CEO, Steve Balmer. Microsoft is finally pushing him out the door. Unfortunately, they don't have a replacement, even though they have been searching for over three years behind the scenes. For months, they have been publicly floating this fantasy of getting Alan Mulally to right the ship. Having had enough of this disruption in his life, Mulally has finally, definitively burst that particular bubble. Mulally was the genius who restored Boeing back to health. Afterward, he worked his magic on Ford. He seems to specialize in taking behemoth companies that have lost their way, and bringing them back to life. 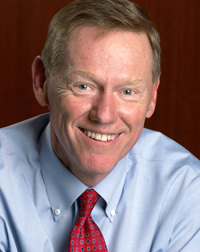 Microsoft is such a company, and desperately needs the Midas touch from someone like Alan Mulally. The only problem is, Mulally is unavailable, and uninterested. Microsoft has been courting him like a pimply-faced adolescent with a crush on his married, forty year-old teacher. It is pathetic, and for Microsoft, quite embarrassing. Mulally has finally told Microsoft to go away. Unfortunately for Microsoft, it is more than embarrassing; it throws their CEO search back to square one. Mulally, a candidate who didn't wanted the job, was their #1. Those inside the company who desperately want the job, have been deemed unfit, otherwise, one of them would already have the job. A company doing well, like Apple, wants to hire from within to keep the success rolling. A company doing poorly, like Microsoft, wants to hire from the outside, to rid themselves of the stink of failure. Now, Microsoft is left with inside candidates, the exact opposite of what they need. It is more than a little problematic that in three years of searching, Microsoft cannot find anyone they trust to run the company, but are in such bad shape, they had no choice but to announce the ouster of the current man in charge.